Car keys; It really depends on the age of the car, the make and model and what type of key it uses. Some vehicles will tolerate a sloppy cut key. Others will not work if the key is slightly off. The best rule is, if it won't turn, leave it alone. House keys; Some house keys will work if they are miscut. These are most often the cheaper quality locks that you can buy at any hardware or big box store. If you are using a better quality product, you will need a better quality key to easily operate your lock. Commercial keys; Quite often you can find homeowner keyways in commercial buildings. Again, it depends on the format as to how accurate the key needs to be cut. Kwikset and Schlage will tolerate some slop. If you’ve ever looked at your lock, you’ll notice that the keyhole is part of a round mechanism. You may have noticed, some commercial locks have a figure eight shape around the keyhole. These locks will require a VERY accurately cut key. In fact, even I have had difficulty cutting these keys on a traditional machine with a round cutter. I use a punch machine that cuts every key exactly to code. It is the only way I can produce quality, accurate keys for these locks. High security keys can be found in both residential and commercial settings and again require very well made keys to work. 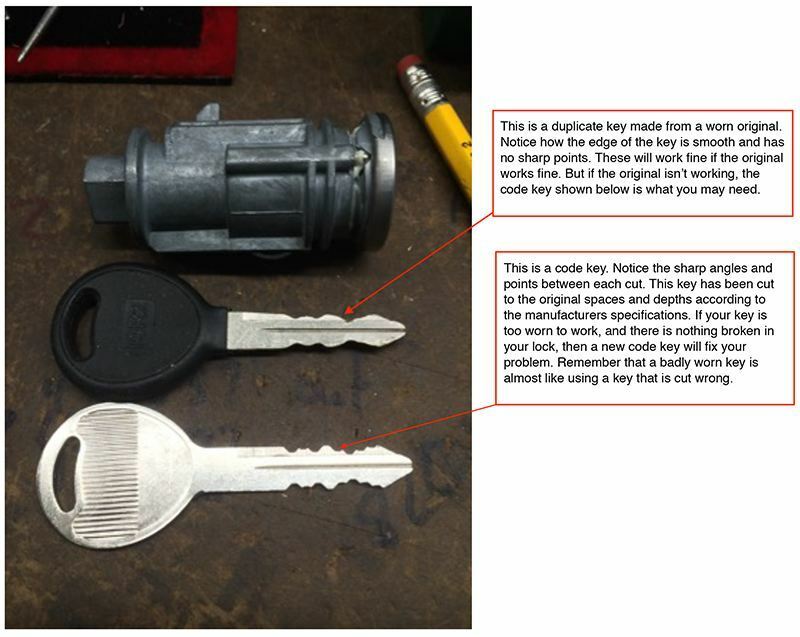 REMEMBER THIS: If your key doesn’t work well now, making a copy will NOT make it work better. It will make it work worse. I recommend trying a light lubricant in your lock first (like WD-40 or Tr-Flow). If the key still is hard to turn, you may need a code key. Think of it like this; If you make a photocopy and it comes out too light to read, do you make another copy from the unreadable one? No! You make a new copy from the original document or you print the original document right?